Some shocking Rebel Alliance news has just come in from The Guardian: Apparently, beloved Millennium Falcon co-pilot Chewbacca has been captured by The Empire, and he’s being forced to drive Darth Vader around Ukraine so he can vote. Chewie is a loyal member of the Rebel Alliance and a veteran of not only the first Death Star battle, but also the Battle Of Hoth and the Battle Of Endor, so there’s clearly some kind of Imperial deception going on here. Also, not only is Chewie acting as a chauffeur for one of the most evil figures in the galaxy, but he is doing such a bad job of it that he got arrested by the Ukrainian police for not having the right paperwork. Now, all of that is true (to the extent that you believe Star Wars was a documentary), but this super weird story gets even weirder: After his arrest, Chewbacca—or the guy dressed like Chewbacca, if you don’t like whimsy—was taken to court and ordered to pay a fine. It came out to be about $7.50, and while a fine that small is mildly interesting on its own, the best part is that this guy dressed like Chewbacca was apparently never asked to remove his mask during the whole ordeal. The Guardian has footage of him being arrested with the mask on (and while fighting officers, in true Wookiee fashion), and it has photos of him sitting in court with the mask on. That can only mean one thing: It wasn’t a mask, and this was the actual Chewbacca hanging around with Darth Vader in Ukraine for some reason. 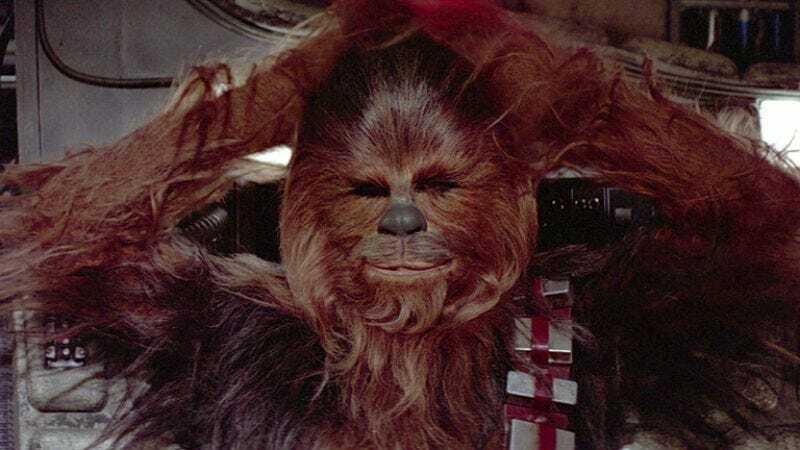 It’s nice that we know at least one concrete fact about all of this, but unfortunately the realization that this was the real Chewbacca still doesn’t help the story make any sense. Oh, and to make matters worse, this incident seems completely unrelated to the Darth Vader statue that was unveiled in Odessa, Ukraine a few days ago. Also, that election Vader was voting in is reportedly turning out to be a huge mess, but we’re not sure how that connects to this. Basically, we have no idea what’s going on. We just want Chewbacca to get home safe to Kashyyyk before Life Day.